Ours thanks go to the club communications sub-committee, in particular we would like to thank Catherine McTiernan and Enda O’Sullivan for piecing together this terrific publication. If you have any photographs, news or other information that you would like to see included in future newsletters, please email: eireognenagh@gmail.com. Yesterday was an historic day for our Camogie Club as, for the first time in our history, we fielded a team in a competitive match at the intermediate grade (Pictured above). Our girls acquitted themselves excellently, defeating Newport in the opening round of the league and securing progress to the Semi-Finals. We play Drom & Inch next, fixture details will be posted as soon as possible. 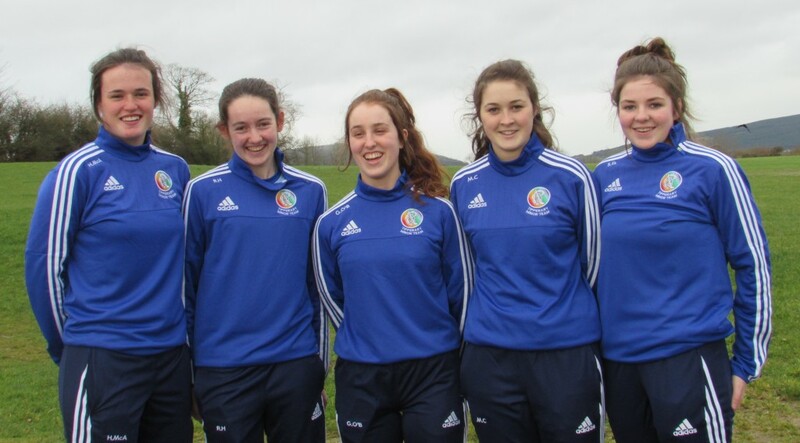 The club would also like to extend it’s congratulations to it’s five members of our Camogie Panel who have been called on to represent Tipperary at Minor level. 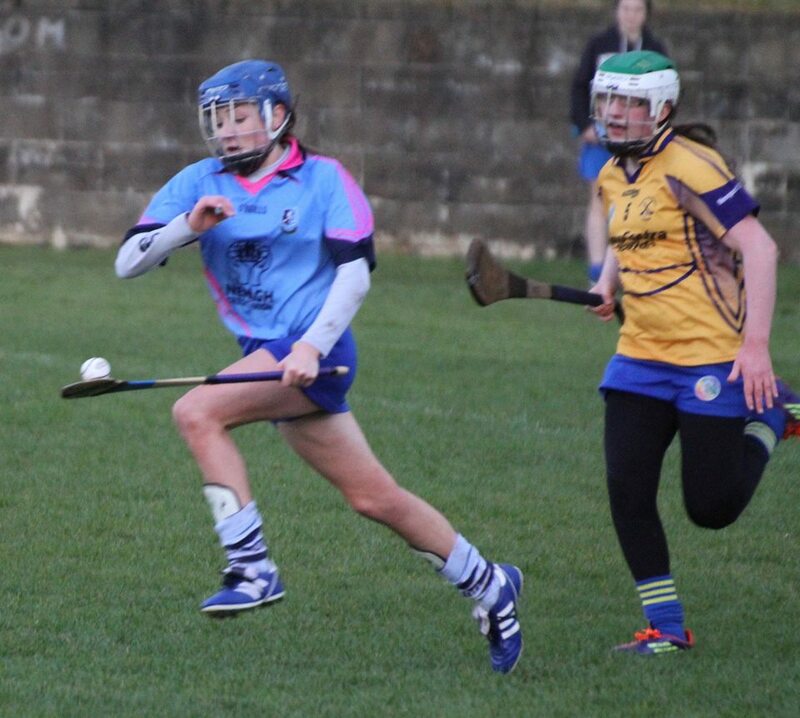 We would especially like to congratulate Ruth Hassett who made her inter-county debut recently against Clare in the championship, following in the footsteps of her All-Ireland winning grandfather Matt Hassett. The five girls from our club on the panel are, from left to right, Hazel McAuliffe, Ruth Hassett, Maeve Coffey, Sarah Quigley and Grace O Brien. Well done ladies from everyone in the club. 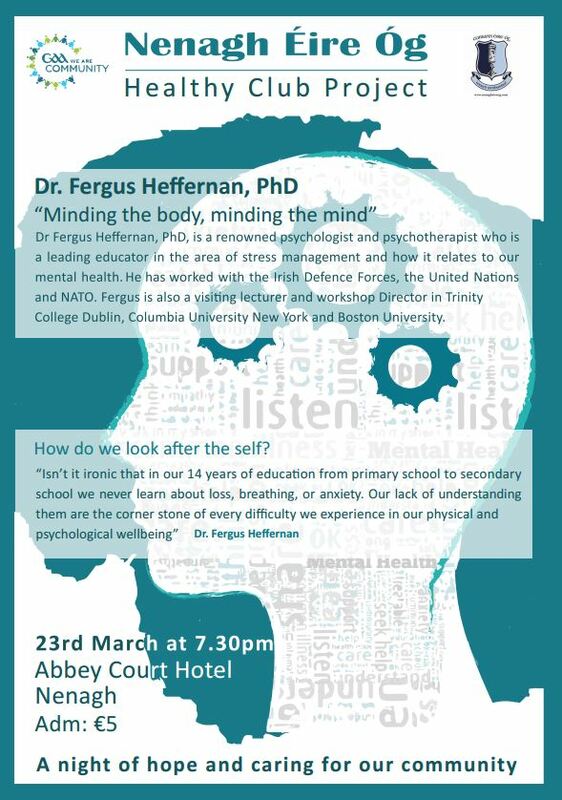 The Club would like to thank Dr. Fergus Heffernan and the Healthy Club Project team, who organized a health and wellbeing night in the Abbey Court Hotel on Wednesday March 23rd . Our Senior hurlers play Kildangan in the opening group game of the 2016 County Championship on Saturday, April 9th at 6:30 p.m in Dolla. Our Junior A hurlers started the 2016 league with a 1-08 to 1-06 victory over Knochshegowna last Friday night. They play Borris-Ileigh on Friday, April 8th at 6p.m in MacDonagh Park, Nenagh. 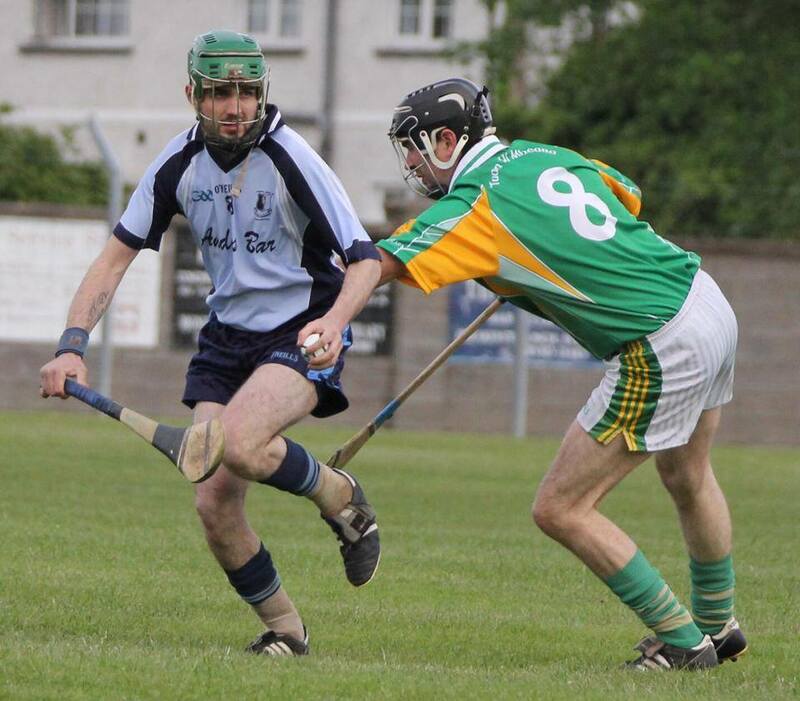 Our Junior B hurlers play Ballinahinch on Saturday, April 8th at 6p.m in MacDonagh Park, Nenagh. Our Minor A footballers play Inane Rovers on Wednesday, March 30th at 6p.m in Roscrea. The draws for the Junior A & B Leagues and championships, Minor and Under 21 hurling were made last week and can be viewed in full on the club website. Our Under-8s will have their first training session on Wednesday at 5.15pm. Our Under-12s training is as usual this week. Next match is on Friday evening against Ballina in Ballina. Best of luck to the boys. Well done to Fiachra Starr, Sean Shanahan Daniel Molamphy and Scott O’Brien who were part of the North Tipp Under-16 panel for the Garda cup on Saturday. Intermediate: Sunday last was another historic day in our history as for the very first time we played a competitive game at the intermediate grade when Newport visited MacDonagh Park for the opening round of the league. Under the management of Paul Henry, Bertie Sherlock and Bob O Brien the girls produced a magnificent performance to defeat their opponents and as it was Newport’s second loss, the win guarantees us a semi final spot. We play Drom and Inch in our next game. Please see the website for details of this game. Well done to all involved. Flag Day: Last weekend we had our annual flag collection and we wish to thank all who so generously donated, all the collectors and the businesses who kindly allowed us to collect outside their premises. Your kindness is very much appreciated. Clothes Collection: We are holding a clothes collection on Saturday April 9th between 10am and 12am in MacDonagh Park. Please bring along all your unwanted clothes, bed linen, curtains, shoes etc to help us raise some badly needed funds. If you cannot make it on the day please contact a committee member who will be delighted to collect your bags prior to the collection. The club’s Junior A team overcame a 5 point deficit to run out 1-8 to 1-6 winners over Knockshegowna in the opening round of the North Junior A League. A late goal by centre forward Mark Tuite proved the decisive score in a hard fought but sporting game. The team lined out as follows. 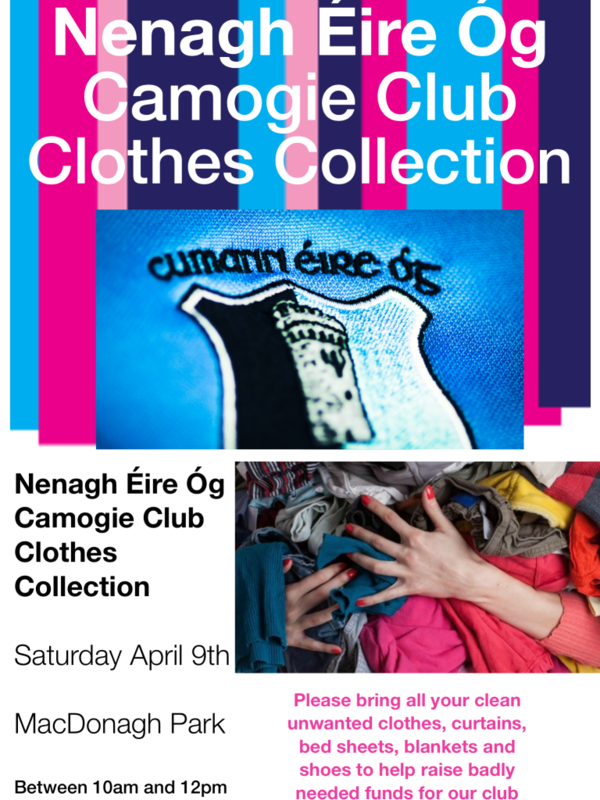 The Camogie section will be having their annual clothes collection in Saturday April 9th between 10am and 12pm in MacDonagh Park. County SH Challenge Cup: Our senior hurlers ran out 1-12 to 0-13 point victors over Kildangan in the second round of the Senior Challenge Cup on Saturday. Membership: A final reminder to everyone and especially all players and mentors that membership for 2016 is now overdue and must be paid to Membership secretary Derek Lillis, any club officer or online before the end of February. The cost of membership is again very reasonably priced at €25 with a family membership option A priced at €60 and an option B priced at €85. Club Lotto: The Nenagh Éire Óg Club Lotto represents the club’s key fundraising initiative. Please consider supporting the Blues by playing our club lotto online. U10 , 12 and 14s training Monday and Thursday 5.30 to 6.30 all players to attend as u 14 Championship is starting Monday 5th April with a challenge match due this week tba. 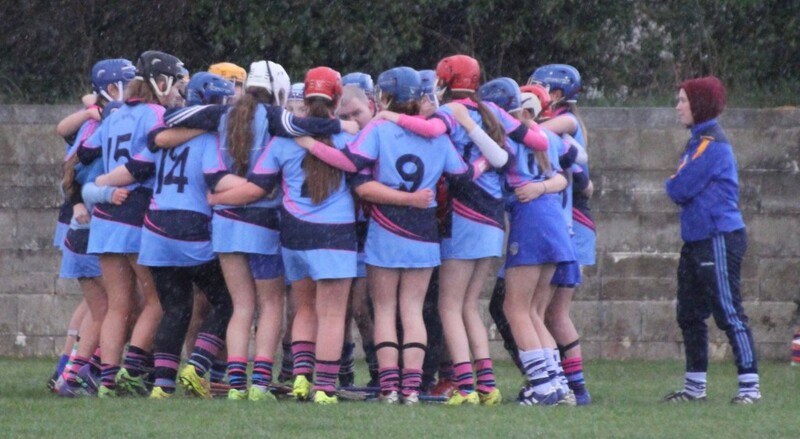 U14 fixtures: Monday April 4th Nenagh v Annacarthy, April 11th Toomevara v Nenagh, April 18th Knockavilla v Nenagh, April 25th Annacarthy v Nenagh, April 29th Nenagh v Toomevara, May 9th Nenagh v Knockavilla. U16 and Intermediate training will continue this week, managers will be in touch with times. The Intermediate team play Newport this Sunday in Nenagh at 12 noon in the first round of the league, opening a new chapter for the club . U16’s first round match is on the 29th all panel members must attend training in readiness for this game. U16 fixtures March 29th Newport v Nenagh, April 5th Nenagh v Annacarthy, April 10th Nenagh v Cashel. Nenagh Éire Óg Camogie Club flag day will be on next Saturday and we are looking for volunteers to help out in this important club fundraiser. Catriona Morris can be contacted at 087-7776135 if you want to help in any way. Clothes recycling is on Saturday 9th April this is another important fundraiser for the club. 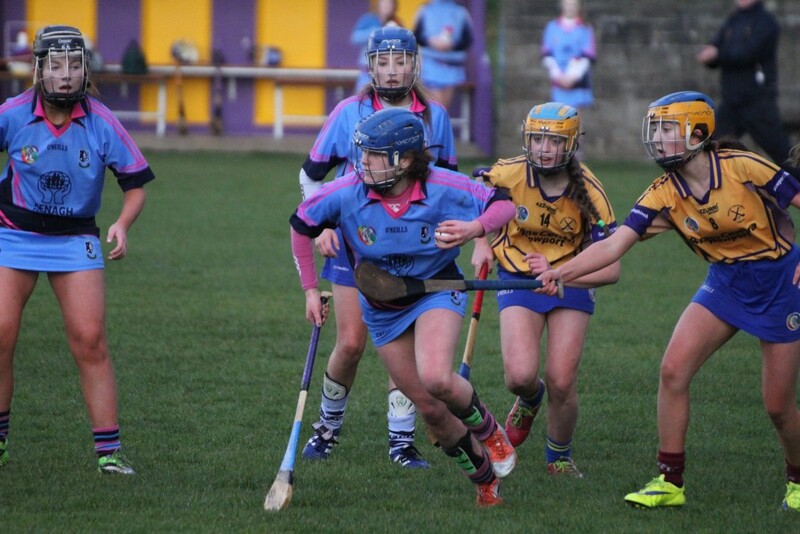 Congrats to Alanna Morris and the Tipperary Senior Camogie team on their second win of the campaign on Sunday away to Offaly which puts them in the reckoning for the league Quarter finals . Congrats also to Meaghan Morris, Abbie Sheedy and Ella Carey who were on the Tipperary u14 team which played Cork on Sunday and have all made the final squad. Registration is due and can be paid to any committee member or team manager. A big thank you to our juveniles and all who helped for their wonderful behaviour walking behind our banner on St. Patrick’s Day. Well done to all and congratulations to Hughie McGrath and the team once again for their great work for the town. Our under-12 players have a bye in the football championship this week. Well done to all for their huge effort on Saturday and your training continues as usual. The under-14 football season begins on Easter Monday when they take part in the Féile Peil, playing Ballina in the semi-final in Ballina at 2pm. The final will follow on the day. Under-16 footballers travel to Roscrea to play Inane Rovers on Monday, March 28th. All out-standing memberships should be paid asap. For insurance purposes, only paid-up members can play. County SH Challenge cup: We have been drawn to play Kiladangan in the next round of the SH Challenge cup. Sympathies: We extend our deepest sympathies to the Kennedy family on the passing of Willie Kennedy. Ar Dheis Dé go raibh a h-anam dílis. Membership: A final reminder to everyone and especially all players and mentors that membership for 2016 is now overdue and must be paid to Membership secretary Derek Lillis, any club officer or online before the end of February. The cost of membership is again very reasonably priced at €25 with a family membershipoption A priced at €60 and an option B priced at €85. 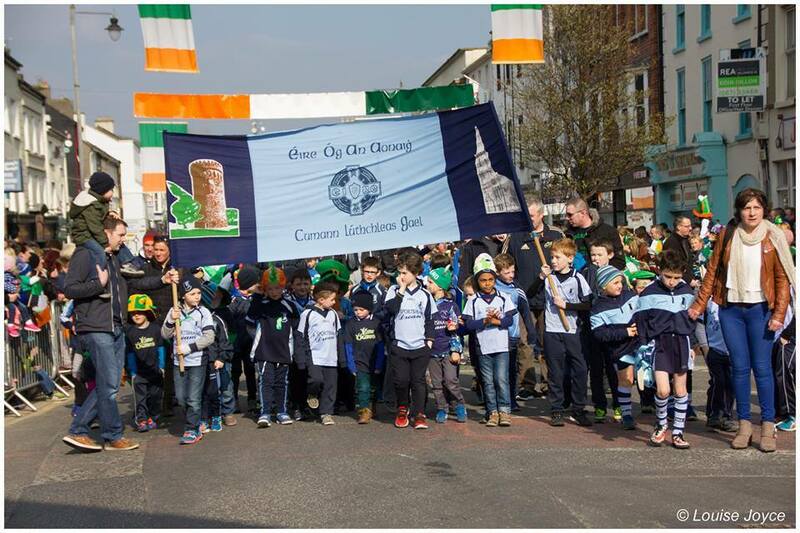 St Patrick Say parade: In keeping a wonderful tradition alive, we invite our U6 & 8, U10 and U12 players to walk with us in the St. Patrick’s Day Parade on Thursday. A very special welcoming invitation to our new Éire Ógres whom we hope will wear their new shirts and walk with us also. Please meet in the C.B.S. Primary on Summerhill at 1.45pm at latest. Parents must meet their boys in the Railway Station car-park as they arrive back after the parade. We will be there with the Goodie-Bags! Under-12: Well done to the U12 A football team on a good win away to Inane Rovers on Saturday. We play Silvermines in the next round matches on Saturday at 2pm in Nenagh. Under-14: Football training continues on Wednesday at 5pm. Your crested gloves can be collected there on receipt of payment. Keep up the hard work lads. Under-16: Training continues on Wednesday at 5pm. We play in our first round of the football championship against Lorrha Rovers Gaels at home on Saturday at 2pm. Please come out to support the boys. Scór na bPáistí: Well done to our participants in the Scór County Finals. Better luck next year to our wonderful kids. Training: All our teams are now back training in preparation for the 2016 season. We always welcome new players and those who may have played in the past and are thinking of coming out of retirement are always welcome back. 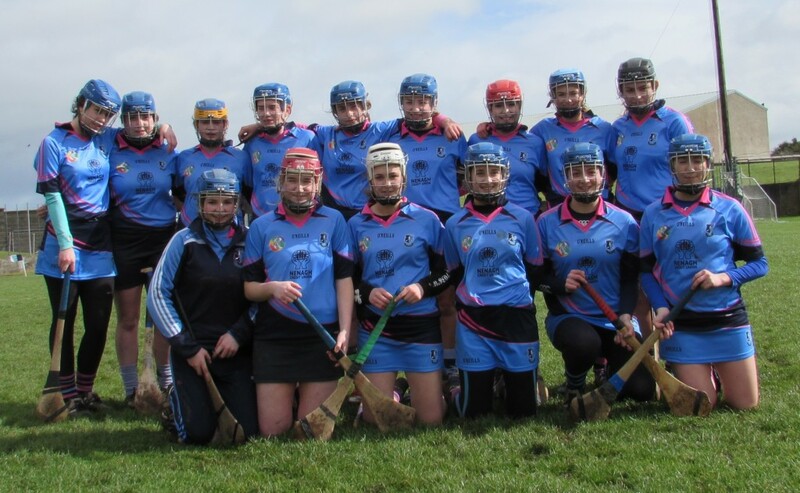 If you would like to play camogie with us for the year please contact eireognenagh@gmail.com. Training for under-8, under-10, under-12 and under-14 is from 17:30 to 18:30 every Monday in MacDonagh Park. Tipperary: Hard luck to both the A and B Tipperary under-16 teams who were defeated in their Munster finals in Puckane on Saturday last. The club was well represented on both panels with Niamh Sheridan, Caroline Browne, Rachel Browne and Lily Purcell all involved. Also Greg Browne was part of the management team. Well done to Grace O Brien and Ruth Hassett who were part of the county minor side who had a great win over Clare at the weekend. Clothes Recycling: We will be having our annual clothes collection on April 9th in the complex in MacDonagh Park. If you are having a Spring clean and would like to get rid of old clothes, curtains, bed sheets, shoes etc please contact any member of the committee and we will be delighted to take them off your hands. Alternatively you can bring them to the hurling field on that particular date. Flag Day: We are having our annual flag day on March 26th and we need volunteers to do just one hour at various locations around the town. If you are will to donate one hour of your time to help us raise badly needed funds please contact Caitriona Morris 087 777 6135. Intermediates: We will be facing Drom and Inch in our very first competitive game at the intermediate grade soon. Please check social media and our website www.nenagheireog.com for details of this historical fixture for our club.